Good morning! 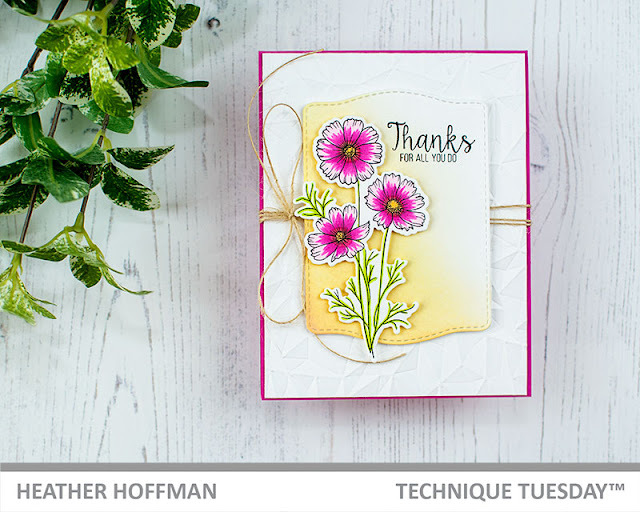 Welcome to the second day of the new release blog hop for Technique Tuesday! All products are now available at Technique Tuesday in the new product category HERE. 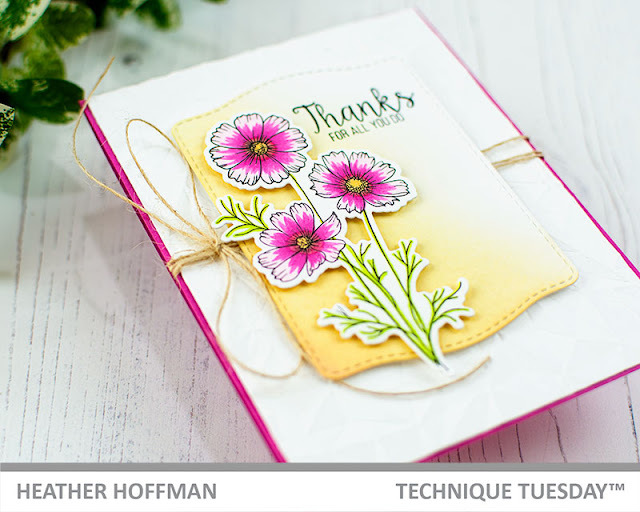 Today I'm using the beautiful new Kind Cosmo stamp set - colored up very simply with Copic markers, then die cut with the coordinating Kind Cosmo Crafting Dies. I used the positive frame from yesterday's card from Essential Stitched Labels Crafting Die, and did a bit of ink blending in the bottom corner before stamping my sentiment and mounting my flowers with foam adhesive over the top. I used a We R Memory Keepers Embossing folder to add some texture to the white background, trimmed it a bit smaller than my bold pink cardbase, tied some twine around the entire card, then mounted my framed florals over the top with more foam adhesive! Love your card. the flowers were nice and the shading in the background was a great accent. Very pretty design. I like how you colored the flowers and the embossed background. we are getting warm (for a few days). Very pretty with the bright pink & yellow color combo. I love these flowers; they're my fave of the release. 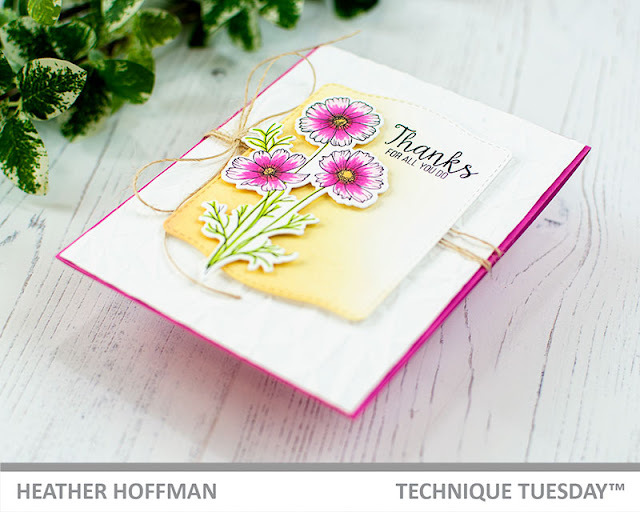 I love the twine and how you matted the card on the pink! I just love how vibrant the card looks! Beautiful card! I love the contour of the Stitched Labels die and the gorgeous cosmos flowers! 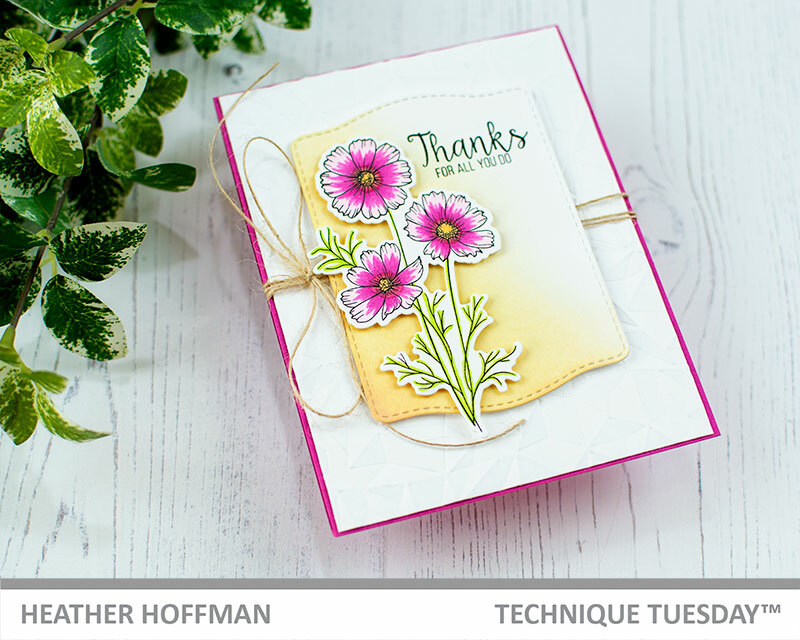 Love your card - love how you faded the yellow color from left to right and put the beautiful cosmo flower on top. Beautiful. Gorgeous card! Beautiful, fresh and dainty - love it! Love the layout! What a gorgeous card! Beautiful colors!! !